As early as 1841 Rev. W B Clarke noted the presence of coal in the Blue Mountains and in 1866 made the first systematic description of the deposits of oil shale in the Hartley area, where its existence had been known from as early as 1824. Seams containing both coal and shale outcrops were noticed by the early settlers in the valley walls of the Blue Mountains and in the 1860s the imminent construction of the western railway encouraged considerable local exploration. The most extensive and successful oil shale operations took place in the Hartley region where, prior to the rail connection, bullock teams carted shale to the railhead at Mount Victoria. With the building of the Lithgow Zig Zag rail line and the consequent extension of the railway to the west, the growth of the Hartley-Lithgow region into a large industrial center founded on the local coal and shale deposits was assured. While the Grose Valley near Mount Victoria also attracted some freelance small-scale exploration from the mid 1860s, it was the Katoomba area that was next to profit from the exploitation of the Blue Mountains’ coal and shale resources. In the 1860's Campbell Mitchell discovered three seams of kerosene shale on the Megalong Valley side of the Narrow Neck Peninsula. With Thomas Sutcliffe Mort he acquired 640 acres here (Portions 14 and 15, Parish of Megalong, County of Cook) and established the Glen Shale Mine. To ascertain whether the shale deposits extended into the adjoining Jamison Valley, he then explored the eastern side of Narrow Neck, including the area of the Ruined Castle Ridge. His investigations revealed profitable seams but the difficulties of transporting it over the rugged terrain to the Western Railway appeared too daunting. In the 1870's, John Britty North purchased a substantial quantity of land, much of which later formed a large part of the developing town of Katoomba. Included in his purchase was most of the land along the cliff front from Echo Point to Narrow Neck and across to the Ruined Castle. North also rented the substantial home ‘Essendon’ (or ‘Essendene’), owned by the Henderson family and built near the present junction of the highway and Cliff Drive. The building, with a large tower was later used as a school and guesthouse, until destroyed by fire in 1929. 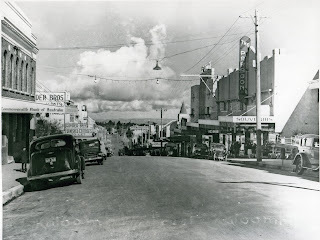 He later built his own home, ‘Lassie Brae’, in Katoomba Street, which was eventually demolished as the commercial centre of Katoomba developed. To exploit the coal seams, which outcropped at the base of the cliffs near the Orphan Rock, North registered a company under the title of Katoomba Coal Mine, in 1870. Once the coal mine was under way, North began an examination of the Ruined Castle area in the Jamison Valley in the early 1880's and, locating two substantial outcrops of kerosene shale, formed another company known as the Katoomba Coal and Shale Co. Ltd. in 1885. In 1882 a loading depot, known as North's Siding was opened on the Western Railway on the Sydney side of what is now ShelI Corner on the western edge of Katoomba. There developed a whole system of interconnected tramways linking this depot with the various coal and shale mines, which opened up in the Megalong and Jamison Valleys to the south. With the opening of the Ruined Castle mines, North imported engineers from Germany to construct an elevated tramway known as the Flying Fox from the company's engine bank - now the site of the Scenic Railway - across the Jamison Valley to the Ruined Castle ridge. A fault in construction resulted in a short working life when, after carrying only 500 tons of shale, it collapsed into the valley below where the wreckage still remains. Considerable money had been invested in this project and the disaster spelled the end of the company. Shale mining at the Ruined Castle ceased and while the coalmine continued for a time, the company soon went into liquidation. In 1890 the Glen Shale Mine in the Megalong Valley was purchased by The Australian Kerosene Oil and Mineral Company, which operated a shale oil industry at Joadja near Mittagong. The following year this company leased the shale mines at the Ruined Castle formerly operated by the Katoomba Coal and Shale Co. Ltd., together with that company's tramway system linking its coalmines near Orphan Rock with North's Siding. The new company concentrated its effort on the Glen Shale Mine. 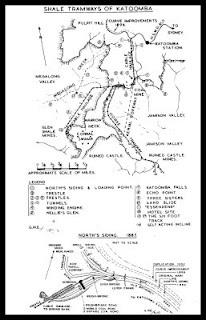 As well as bringing a large quantity of machinery and transport equipment to Katoomba from their operations at Joadja, they tunnelled through the coalmine at the base of Engine Bank and then through the Narrow Neck to link the Megalong Valley operations with those in the Jamison Valley. A single-track horse tramway was laid out beneath the eastern ramparts of the Narrow Neck Peninsula linking the Ruined Castle mines with the double-tracked skipway before entering the Narrow Neck Daylight Tunnel. From 1895, the shale mining activities at the Ruined Castle and Glen Shale Mines gradually decreased. The seams were becoming exhausted and the returns from sales were reduced. By 1903, the shale industry at Katoomba ceased to exist. Most of the equipment was transferred to the Australian Kerosene Oil and Mineral Company's operation at Torbane. The lease at West Katoomba expired in 1906. 1. Settlement in the Engine Bank/Katoomba Falls Area. Several streets of weatherboard cottages extended from the Engine Bank to the intersection of the road now known as Golf Links Road, (the location of this raod is currently unknown). A hotel, The Centennial, later known as The Falls House, was destroyed by fire in 1973. A small store also existed but has long since disappeared. When the mine closed the miners’ cottages were bought by Paddy Mullaney who rebuilt them at the lower end of Leichhardt, Clissold and Vale Streets, Katoomba where many still stand. At the foot of Nellie's Glen existed a sizeable mining settlement with a large hotel, butcher's shop, bakery and public hall but this settlement did not survive the end of the shale industry in 1903. In 1904 the hotel was moved in sections by bullock team and re-erected in Lurline Street where it became a guesthouse known as ‘Maldwin’. 3. The Ruined Castle Settlement. The settlement here was predominantly made up of quarters for single men. The building materials used consisted of bush timber, bark, kerosene tins and whatever was at hand. This settlement also faded away with the end of the shale works. In 1925 there occurred a revival of North's long abandoned coalmine below the cliffs at South Katoomba. A local syndicate formed the Katoomba Colliery Ltd. and resumed mining activities on a lease of 160 acres. The old workings supplied a substantial quantity of coal, which was sold on the local market, principally to the Katoomba Electric Power House and in smaller amounts to the hotels, guesthouses and local residents. During the Depression however, capital costs increased and the local market was reduced. Despite its decreasing viability, the mine continued to operate until the Second World War. However as the company progressed toward liquidation, one aspect of its operation had a parallel rise in fortune, and helped to augment the mine's declining income. 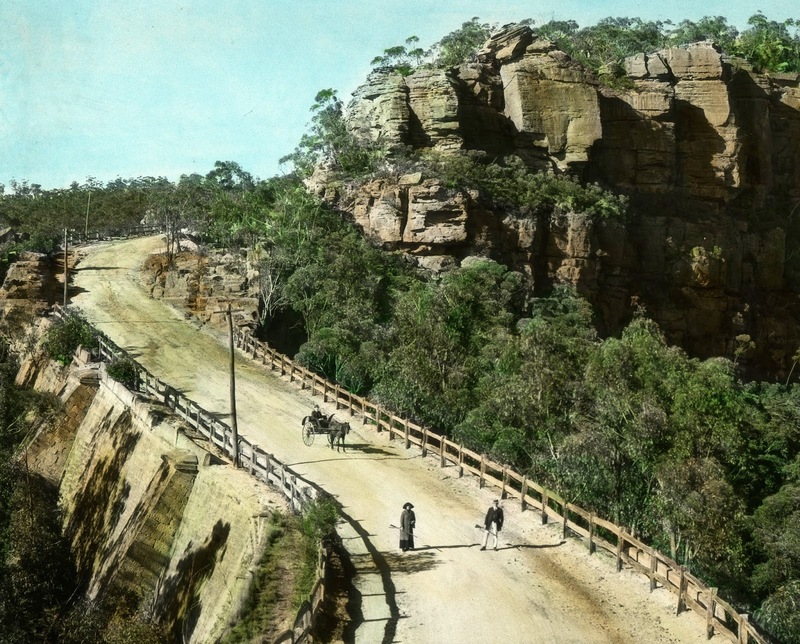 The rehabilitation work carried out on the coal haulage system up the cliff face opposite Orphan Rock integrated into the booming Katoomba tourist industry of the 1920's and 1930's. 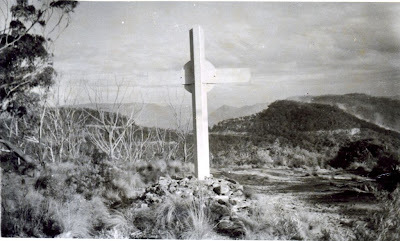 The "Mountain Devil" of the early 1930's became eventually the "Scenic Railway" of today. The exploitation of the coal and kerosene shale deposits in the Jamison and Megalong Valleys brought the Katoomba region to wider public notice than its earlier use as a stone quarry and began to establish it as a population centre. During the latter half of the nineteenth century, Katoomba was known principally as a coal-mining town. However the influence of the mining operations upon Katoomba's early development coincided with another vastly different trend, which began to make itself felt at about the same time: the development of the Blue Mountains as a tourist and recreational destination and recognition as a valuable natural and wilderness area, culminating in its recognition as a World Heritage Area in December 2000.